If you’re old enough, you may remember a time when nearly every service station had a rack full of state roadmaps and national atlases they provided free of charge to gas customers. Journeys were planned by looking for the place you wanted to go, and considering all the routes that could get you there. Actually, gas station customers ask for E15 all the time. They don’t specifically mention E15, but aren’t they always asking for lower-priced gas? You’ve read all the consumer surveys – 70 percent of drivers say they buy fuel based on price. Every year, in one survey or another, consumers say they’ll turn across a busy street or drive five minutes out of their way to save money. That matches the real world experience of current E15 retailers. 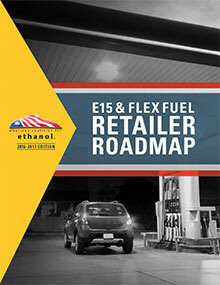 Since EPA approved E15, retailers who’ve added it say it has become the first or second best-seller. Not because they quit selling the other grades of gas - E15 doesn’t replace “regular.” Eighty percent of cars can use E15, but 100 percent can still use regular Most retailers adding E15 experience gain in overall customer count while retaining all or most of their E0 and E10 volume. There’s no market for it." Ethanol opponents spent (and continue to spend) a lot of money hiring PR firms to terrify stations away from offering E15, and their huge, expensive misinformation campaign has been effective. Four years after the first stations added E15, with a complete and utter lack of damage complaints or claims and not a single warranty voided over the use of E15, concerns over nebulous “liability” issues still exist. How do you know no engine has been damaged and no warranty voided? Simple. If even ONE had, the PR machine that created the liability boogeyman to scare retailers would have made the victims household names. If you’re still worried, over 25 million cars on the road today are built and warrantied to use E15, all FFVs can use it under warranty, and that market grows by ten million vehicles or more every year. The market is here today and getting bigger, and you are “liable” (see what I did there?) to lose a lot of customers by not offering E15. Most of the staggering cost estimates you’ve heard are the result of purposeful confusion and assume you would build a new station from the ground up to sell E85. Actually, according to the United States Department of Energy’s National Renewable Energy Lab (NREL), virtually all underground storage tanks and UST systems are already compatible with up to 100 percent ethanol. NREL audited equipment companies and verified this equipment compatibility fact. As far as “above ground” equipment goes – dispensers and hanging hardware - according to the Petroleum Equipment Institute and United States Department of Agriculture, most stations can add E15 for as little as $1000 and stations that want to convert dispensers for E15 pay less than $1000 per fueling position. The cost of the E25 compatibility option on new dispenser is only a couple hundred dollars, and if you need to upgrade, financial assistance is often available. Program descriptions and contact details can be found on the state pages of this website. "I can’t afford to add all that equipment for E15 and flex fuels." If you have a branded oil company sign sitting in front of your station, you could be stuck, prohibited from selling E15, unless you can afford to quit the brand and/or can get out of paying a penalty to get out of the contract. We know of examples of station owners who have broken free from oil company contracts, began offering E15, and were able to make it work (watch Charlie Good’s story on flexfuelforward. com), and we’re aware that’s the exception, not the rule. If you’re unbranded, consider yourself lucky, and if your contract is coming to an end, consider your options before you sign another one. You don’t want to have to compete with E15 using higher-priced, lower-octane regular for ten more years. Note: Some states have enacted legislation that does not allow oil company contracts to restrict the sale of E15 and flex fuels. Check out your state’s regulations in the State section of the Roadmap . Registration, testing, and oil-lobby inspired weird hose rules can be a pain, as well as EPA’s outdated evaporative emissions (Reid vapor pressure or RVP) regulations regarding gasoline in the summer months. EPA’s stubborn refusal to allow E15 - a cleaner, less emitting fuel - to be used from June 1 through September 15, means station owners in conventional gasoline areas can’t offer the fuel year-round to their customers. EPA doesn’t like the “E15-as-flex-fuel” approach, so look for them to add another E15 hurdle soon. We’re working to fix this problem and encourage you to contact your congressional delegation and EPA to help.